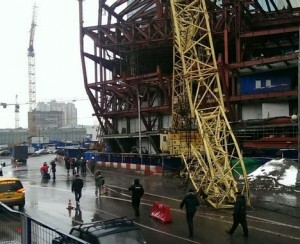 Exceptionally strong winds are blamed for the collapse of a tower crane in central Moscow yesterday. The crane looks like a fairly dated bottom slewing luffing tower crane, its triangular section tower and jib blew over the back of the machine base, with part of it apparently striking the rear end of a passing car. However no one was injured in the incident, which occurred in Testovskaya Ulitsa in the business district. More modern top slewers nearby were unaffected by the winds.